Josh Donaldson hopes his successful loan spell with Civil Service Strollers can act as a potential springboard to the Dundee United first team. The former Scotland Under-17s goalkeeper joined Gary Jardine’s squad in December – initially on a one-month loan before having his deal extended until the end of the season – while continuing to turn out for the Tangerines’ reserve side. Donaldson’s stint in the Capital has been a productive one, keeping three clean sheets and helping the Muirhouse men to their highest-ever points tally in the Lowland League. The 18-year-old will return to Tayside in the summer under the watchful eye of manager Robbie Neilson, maintaining the aim of making his senior breakthrough at Tannadice. 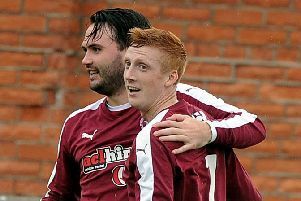 “I’ve really enjoyed my time with Civil so far and it been great to get some first-team experience under my belt,” stated the Kirkcaldy native after Saturday’s narrow 1-0 defeat by Kelty Hearts at a rain-soaked Christie Gillies Park. “This is my first loan spell away from Dundee United and it’s been a lot more physical compared to playing reserve team football, so it’s definitely been beneficial for me. Robbie watches a lot of the reserve games with Dave Bowman and has been keeping tabs on my progress. It’s up to me to do the best I can to impress him. I’ve been training full-time with United during the day then travelling down to Edinburgh once a week on a Thursday for training, which has helped me get to know the boys a lot better. 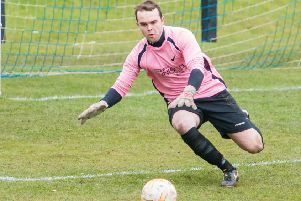 Donaldson praised the work of Dundee United goalkeeping coach Neil Alexander, whom he believes has played a significant factor in aiding his development. “I spend most of my time working alongside Neil,” he added. “Hopefully he’s been happy with my progression and I feel like I’ve improved and matured quite a lot since he joined the coaching staff. “He’s a former Scotland internationalist and is a great person to be learning from. He’s always encouraging me and analysing certain areas of my game I could improve on. “The goal is obviously to try and make my first-team breakthrough at United, but I’d be keen to go out on loan again next year to a League Two club perhaps and see how I get on. Elsewhere, relegated Whitehill Welfare drew 1-1 with Gala Fairydean Rovers at Ferguson Park. The visitors led courtesy of Phil Addison’s deflected effort on the half hour mark before Mikey Hamilton headed home Kevin Keane’s corner to ensure a share of the spoils.